I was convinced that if I ever had a daughter she would never wear pink or anything floral, or even remotely like princesses. Well, I had a girl, and all she does is wear pink flower dresses and watch “Cinderella” on repeat. She just had her third birthday and when asked about a theme for her party, she simply responded “princess”. She then flounced away in her sparkly plastic tiara, leaving a plastic dress-up shoe behind. 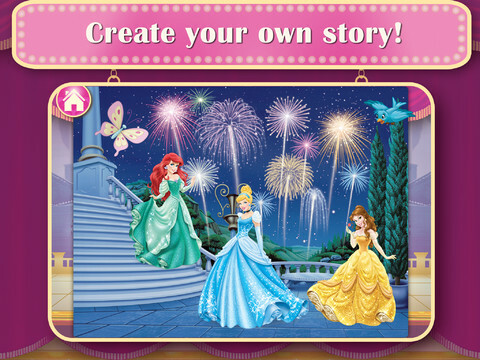 Disney Princess: Story Theater is everything my little royal could ask for, all wrapped up in an app for her to enjoy. 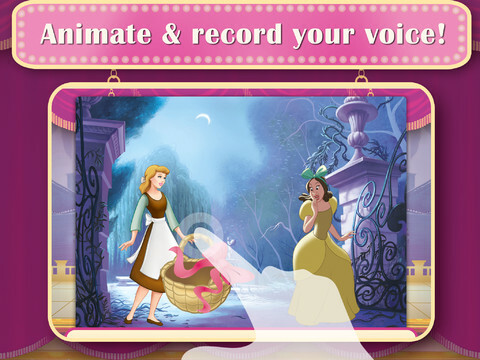 Two different modes let players create a story from scratch, using characters and objects from Disney animated movies. The second mode – story mode – starts with choosing a character and provides a story for players to animate. Both modes use recordings of players’ own recorded stories, which means little minds aren’t limited by the story on the screen. Objects used in the animations can be resized, rotated, and moved. After they’re created the stories can be saved to the iPad and shared via e-mail or social networking. I haven’t had a chance to show Disney Princess: Story Theater to my daughter yet, but I’m certainly impressed so far. She won’t have much trouble learning how to create her own story because the directions are narrated and demonstrated for even preschoolers to understand. Priced at $2.99 it’s considerably less expensive than many Disney storybook apps, but you certainly will get your money’s worth. The directions make it all-ages friendly, and the user interface is easy to navigate. If your mini monarch needs a new creativity-boosting app, this is the one for her!